She might be young, but she is certainly dangerous. 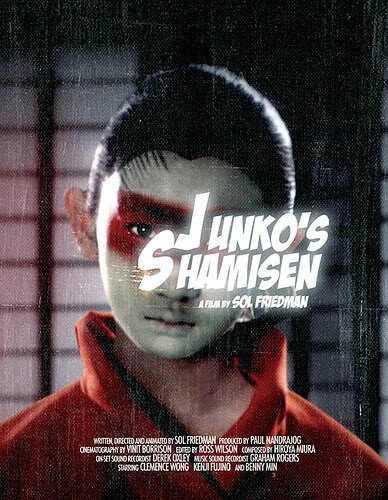 Inspired by the great costume revenge epics of Japanese cinema, but reflecting a visual style seemingly derived from manga and pop art, Sol Friedman’s short Junko’s Shamisen (trailer here) is one of the more dazzling films of any length to screen at this year’s Brooklyn International Film Festival. Programmed as a selection of the festival’s experimental film track, Junko’s production is indeed quite daring. Friedman superimposes several forms of animation (traditional cell, computer, and stop-motion) within a live action world designed to evoke the look of comic art. He intriguingly creates 3-D textures by layering 2-D period-piece backdrops atop each other. The overall impact of his mix of visual effects is quite arresting. However, Junko’s narrative structure is far from avant-garde, telling an easily accessible, classically archetypal story. When Junko’s blind grandfather is impulsively murdered by a tax-collecting samurai lord, she sets out for revenge, like a junior Lady Snowblood. She is accompanied in her ten minute (give or take) quest by her supernatural spirit guide, an animatronic fox. Yes, there is also a traditional score, featuring the stringed shamisen. With its floating onomatopoetic words and dialogue boxes, Junko’s comic and anime roots are clearly evident. There are also shades of high-end Japanese revenge dramas from the likes of Ichikawa with a dash of j-horror mixed in. More importantly, it is just a flat-out cool film. Though more of technical achievement on the part of Friedman and his key collaborators (including cinematographer Vinit Borrison and stop-motion animator Pete Levin) than an actor’s showcase, young Clemence Wong still acquits herself qui te well in the title role. Despite youthful age she captures the stone-cold seriousness of a good vengeance movie protagonist. Junko is thoroughly entertaining short and a legitimately impressive feat of filmmaking. Deeper and richer than most special effects blockbusters, it should become a cult favorite as it travels the festival circuit. It screens during BIFF as part of a block of short films this Friday (6/11) at indieScreen and Sunday (6/13) at the Brooklyn Heights Cinema.